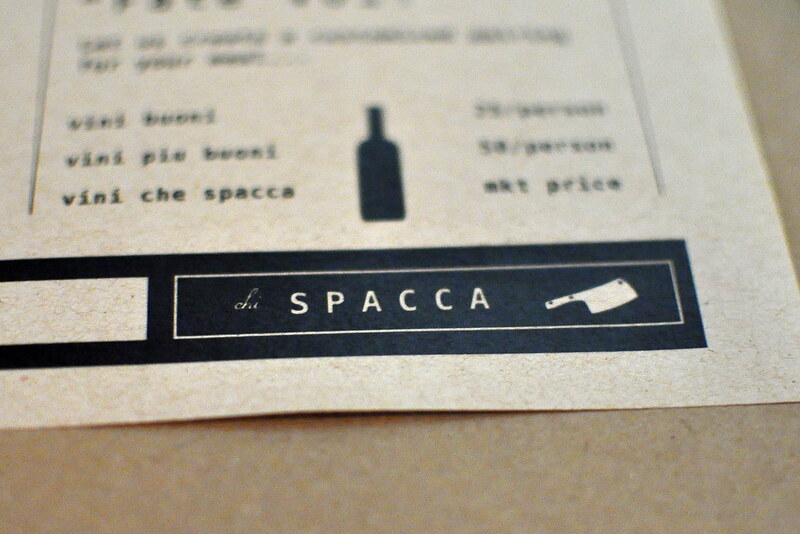 My first dinner at chi SPACCA was this past May in honor of Mother’s Day. Mama appreciates fine charcuterie (paired with finer wine, of course) and I had heard very good things about the house-cured meats served at this latest addition to the Mozza family. The kitchen is headed by Chef Chad Colby and overseen by Nancy Silverton and her partners Joe Bastianich and Mario Batali. 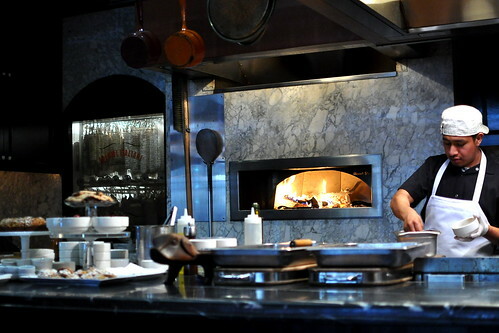 The space, which was formerly the site of Scuola di Pizza, is dominated by the open kitchen, which is in turn dominated by a massive grill. chi SPACCA is best known for its generously portioned proteins, like the 42 ounce Tomahawk pork chop ($80) and 50 ounce costata alla fiorentina ($210). Both are grilled on an open flame and are perfect for sharing with groups. I stuck mainly to the menu’s smaller format dishes on my two visits due to not having enough mouths around the table. A third visit, with a posse, is definitely in order. During both dinners, our waiter made it a point to mention that chi SPACCA is the only local curing facility to be certified by the board of health. For me, all that matters is how the product tastes, legal or not. 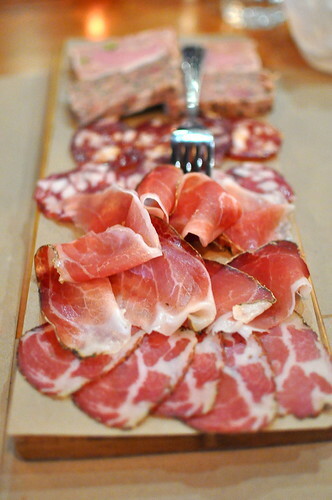 The affettati misti ($24), a wooden plank piled high with hams, salamis, pates, and terrines, was quite the sight. I love bounteous displays, especially when they involve cured meats! 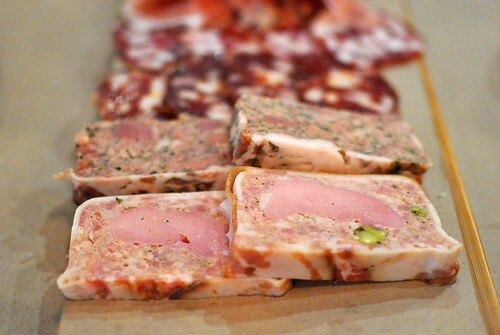 While the fatty salamis and silky hams were both quite good, it was the rabbit terrine wrapped in bacon and studded with pistachios that Mom and I liked most. 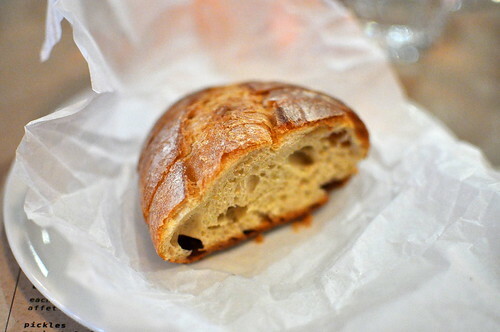 We were provided with hunks of crusty bread to eat with our meats. We also shared the “testa & prawn frittata” ($16) as a starter. 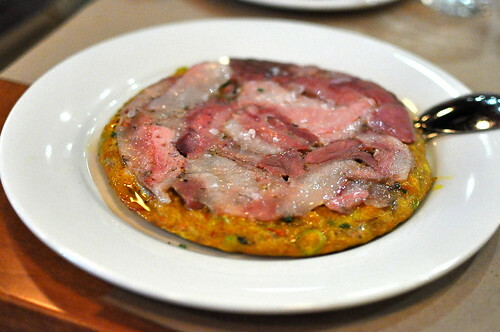 Embedded with prawns and a good amount of fresh chilies, the golden and fluffy omelet was finished with slices of headcheese. I liked everything about this mash-up of flavors and ingredients, but it seemed a little out of place somehow served in this Italian palace of proteins. 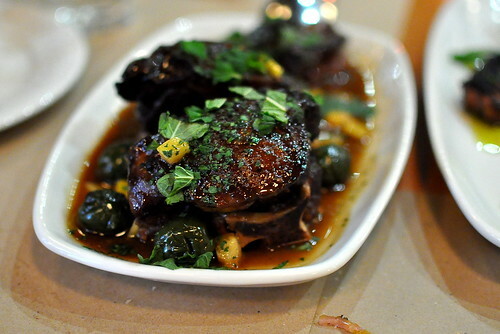 Since our party of three was too wee for monster-sized chops and steaks, we settled on the porcini-rubbed beef short ribs ($32). 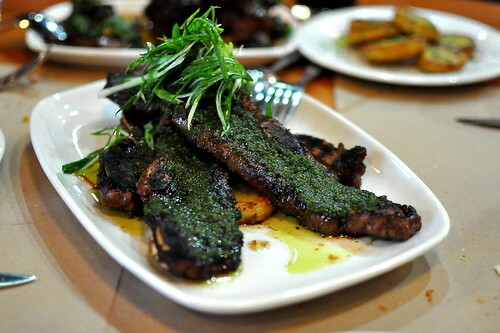 Served over potatoes and with a slathering of salsa verde, the Italian galbi was well seasoned with an excellent char. Next up was the lamb neck stracotto ($27). Braised for four hours in its own juices, the undoubtedly tender meat slid off the bone and right past our lips. Its flavor was robust, but not as musty as we were hoping for. 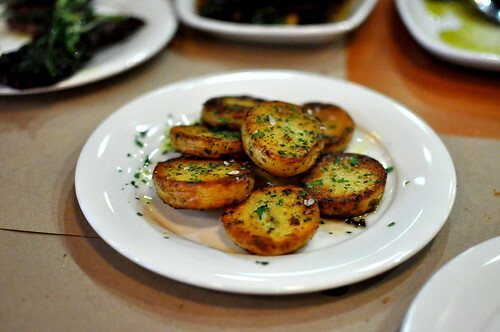 Mom requested a side of Spacca potatoes ($10), which were fine lil’ starchy pucks but nothing of note. My first visit to chi SPACCA was solid enough, but none of the dishes knocked it out of the ball park—base hits and doubles, all of them. I was inspired to return after reading about the focaccia di recco, a new menu addition that was the result of two years of research by Nancy Silverton and Chad Colby. Additionally, the restaurant was sold out of its famous beef and bone marrow pie on my first trip, so I had to come back to give both a go. 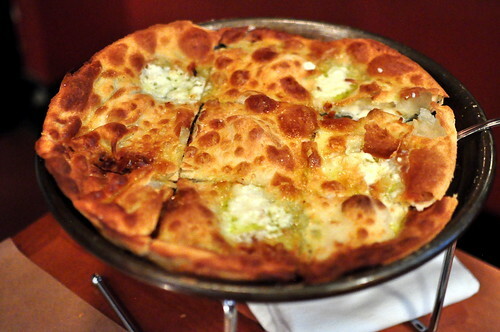 First up was the focaccia di recco ($18), a simple yet immensely satisfying creation comprised of a thin, unleavened dough base (flour, water, olive oil, and salt) topped with mozzarella, drizzled with olive oil, and finished with coarse salt. Fired in the oven, the pie arrived gorgeously golden, crispy throughout, and full of molten cheesy pockets. Between me and my dinner date Sarah, we ate the entire thing with ease. So. Good. 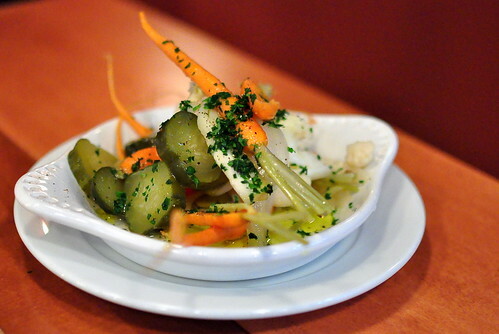 A side order of pickles ($5) was essential for combating the focaccia’s intrinsic richness. 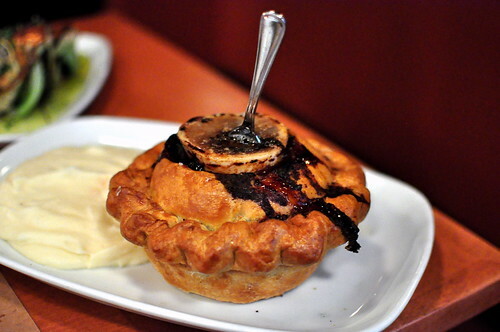 For our main course, we shared the beef and bone marrow pie ($40). Beneath the flaky, well-assembled crust was a gorgeous beef stew brimming with mushrooms; it was the very definition of hearty. The marrow-filled bone was totally gratuitous, as were the silky mashed potatoes; both were totally welcome. The menu states that the pie is intended for two, but three to four is more like it! 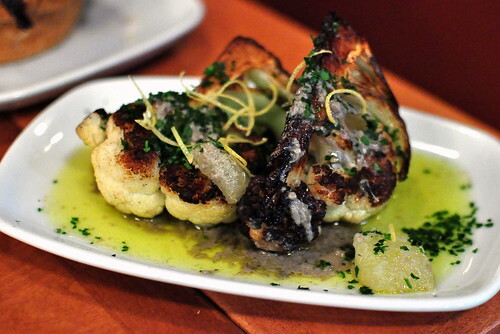 As a light and bright contrast, we also shared the roasted cauliflower with crushed lemon and bagna cauda ($10). The flavors were funky and seriously fabulous. 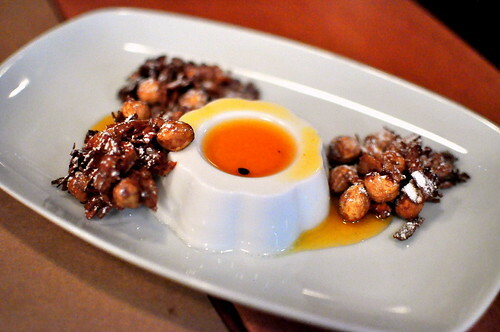 And because we both have killer sweet tooths, a coconut panna cotta with passion fruit caramel ($10) to finish. Smooth, cool, and just a touch creamy, the panna cotta provided a fine conclusion to our meal. 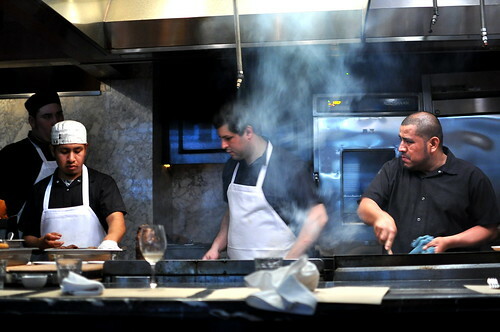 Whereas my first meal at chi SPACCA wasn’t particularly noteworthy, my second visit was superb. I’d return again for the charcuterie, focaccia, beef and bone marrow pie, cauliflower, and a huge slab of cow. I want to be a part of this posse next time! YES, Darin! We need a meat eating brigade. Thanks for the memories! And count me in for the posse, too. I’m hitting Lawry’s for my meat fix in the meantime. Sarah – Damn good call on the Lawry’s front 😉 and you MUST come eat a whole cow with us! 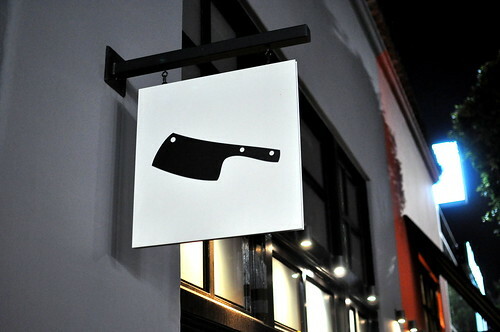 It’s my favorite restaurant in LA currently mainly because of the dishes you tried on your later visits. Good move giving it another shot.